This particular watch has a mechanism built in Switzerland inserted into a gold case built in Canada. It was awarded to VS Dyson, when he retired from his job at Canada Foundries and Forgings Ltd., after 28 years. 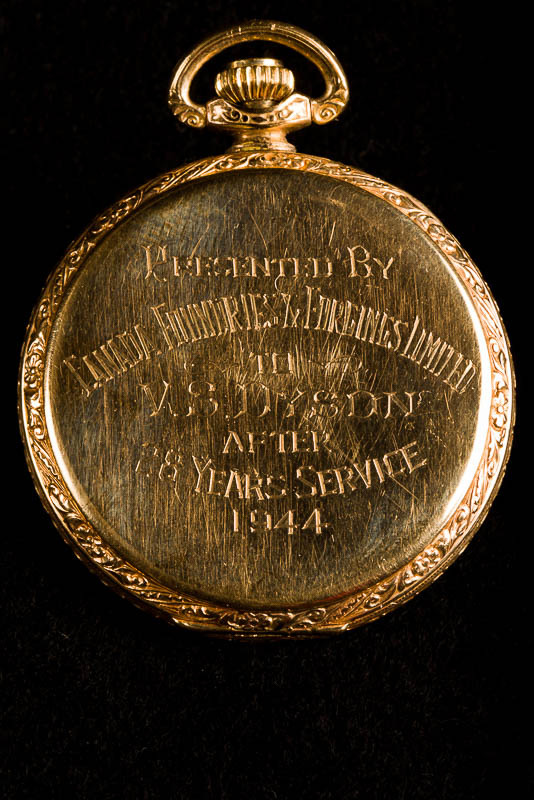 In 1944 they actually did give gold watches as retirement gifts. 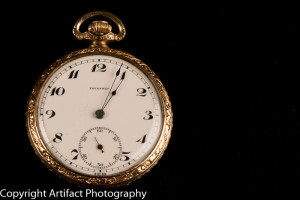 The challenges with taking a photograph of a gold watch are reflections and positioning. I wanted to clearly show the engraving on the back because it’s a record of an event, and because the engraver’s technique is clearly visible. Instead of using a rotary grinding tool as they would today, the engraver used a miniature gouge and painstakingly carved the lettering. I placed the watch on a bean bag which was placed under the fabric backdrop so that I could minutely adjust the angle of the watch. I placed a strobe at the side with a soft box to rake the light across the watch, which is why all of the minor scratches show so clearly, and I placed another at about a 45 degree angle on the other side to provide fill light. I also mounted a black umbrella above the set because the gold of the watch was reflecting the ceiling and the top of the backdrop. The same lighting was also used to take both sides of the watch, the side view, as well as two angles of the interior: one showing the mechanism and the other showing the maker’s engravings on the lid. In Lightroom, I balanced the colour, removed lens distortion, and deepened the blacks to remove the texture of the backdrop (it’s fuzzy). I took it into Photoshop to further remove some of the details still showing in the backdrop, because it took attention away from the watch.